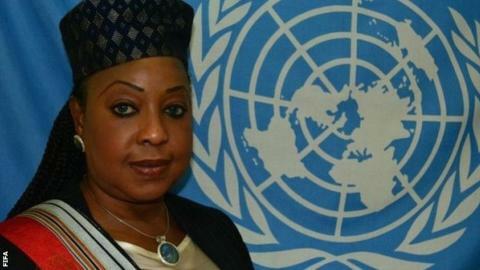 The Confederation of African Football (Caf) says it is not expecting any favours from Fifa's new secretary general, Fatma Samoura of Senegal. Samoura became the first African to ever be handed the post ten days ago. "She's the secretary general of Fifa, the world body, not Africa," Caf's Hicham El Amrani told BBC Sport. "Even if her origin does play a role in her understanding the environments or the different mechanics between nations or confederations." The Confederation of African Football is not expecting any special treatment from Fifa's new secretary general, Fatma Samoura. Nonetheless, El Amrani believes Samoura's roots and extensive work across Africa - having operated in Cameroon, Chad, Djibouti, Guinea, Madagascar and Nigeria for the United Nations (UN) - can only help when it comes to the continent's football. "That's a benefit indeed - her coming from the continent," said El Amrani, Caf's General Secretary. "For sure she has been working throughout the continent during her long experience with the United Nations so I am sure that her understanding (of Africa) is a given fact." While the appointment of Fifa's first female secretary general came as a shock to many observers, El Amrani says he was not one of them. "For us, it's not a matter of surprise. We were delighted about her appointment," he said. The 54-year-old comes from a non-football background, having spent the last two decades working as a diplomat for the UN. "Even if people say she doesn't have a strong background in football, the Fifa President and Council cannot take such a light decision so we are sure - we're pretty confident - that she will do a great job," El Amrani insisted. "The only thing we can say is that we will support her in any way we can and that we wish her all the best in this very important function." Samoura is expected to start work in mid-June but will need to pass an eligibility test beforehand. Fifa has been beset by problems in recent years but is backing the West African to bring her crisis-management skills to her new role. Having recently represented the UN's Development Programme at a summit in Nigeria to discuss efforts to defeat Islamist group Boko Haram, Samoura has also worked in areas such as Afghanistan and Darfur. "My selection as Fifa secretary general as is a demonstration that (Fifa President Gianni Infantino) would like someone who can overcome sexual, religious and social differences and really bring experience in terms of good governance but also accountability and transparency." "I think that he found in my profile all those competencies," she told the BBC after her appointment. The daughter of an army colonel and a mother of three, Samoura's husband had a brief career as a professional footballer himself until injury ended his career at the age of 20. A friend of Cameroon's 1990 World Cup star Roger Milla, the Senegalese - who plays football herself - speaks English, Spanish and French in addition to her native Wolof.